Back around Christmas time, I received a very small sample of some raw flakies from Kaila at TKB Trading. She wanted to know what I thought of them and whether they should get them in stock. Cause the sample size was very small, I just mixed a little of each colour provided into a mini 5ml bottle with suspension base. I then applied it over black. I only took comparison photos against other flakie polishes, as I wanted to show Kaila the difference, and stupid me didn't take a photo of the fully mani! My bottle mainly comprised of gold and green. I only had a tiny amount of the red and blue flakies, so they don't show up much in this polish, but the red flakes look more pink and purple in my photos. The blue ones are clearly blue, but there aren't many in my bottle. I was so excited to try these out mainly because until now, I have not been able to locate any raw flakie that you can add to polish and it didn't lose it's colour. I know MK over at Polish and Pigments has done a huge amount of research on this too. Anyway, I told Kaila that they should definitly still stock these, even though they are not as bright. Mainly because there still isn't anything else available as a flake. I will be getting some more because they will certainly make an interesting addition to my frankening supplies. 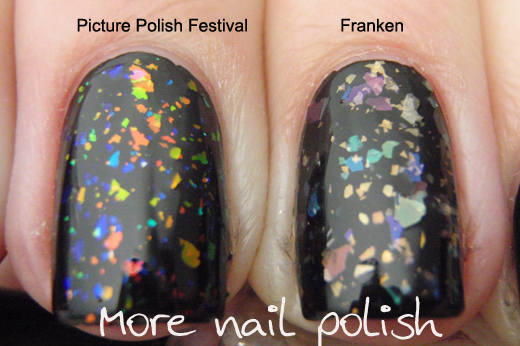 I think these same flakies are also now available from You Mix Cosmetics and Frankenpolish Shop. I have no experience yet with either of these companies, although I have recently ordered from You Mix Cosmetics so will know in the future. TKB Trading now have these in stock and my experiences with them has always been excellent. Thanks for showing these. Love flakes! Although they're not AS bright as others, some might prefer a more subdued look. Thanks for sharing this. I just did an order from TKB just before they put these up and was disappointed I missed them. Now I'm not :) They just aren't bright enough for me. I've tried the gold and the blue superfine flakies from You Mix and was really pleased with them. The blue bled a tiny bit but the gold didn't at all. Doesn't look like they have the gold now, just bronze. I love it like that!! These are mylar flakes I believe, they're very pretty but not the same as the traditional flaky polish material. CG Luxe and Lush, CC Covered in Diamonds seem to be made of these as well. Interesting and unique! Your mixing is underfull but I must confess that PP Festival won my heart! I really like your fraken. They are like pastel flakies. So different to everything we are getting atm. Ooo! I like them! I just placed an order. Enabler! Very pretty! I saw these on TKB a few days ago but I wanted to wait for pics before ordering. I think they look nice - different than the flakies I've been seeing which makes them interesting. Amazing! I quite like these, they are a bit more subtle and pastel - it's a nice change. 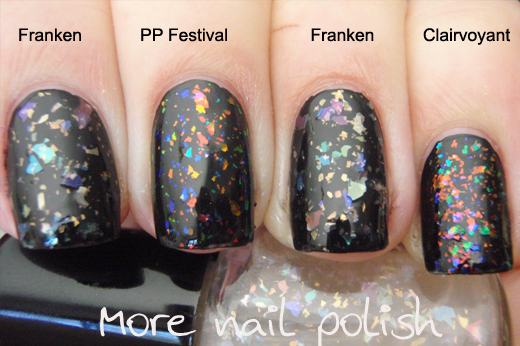 I recently bought Australis' new flakie (mainly because I was so excited to see a flakie that i didn't have to order over the internet) and was a little disappointed to go home and find it an *exact* dupe for PP Festival. Nice to see something different!